Many social media based applications allow users to upload photos and these photos are usually displayed in a timeline for their followers and others to see. In the past, you would have had to refresh your feed manually to see new photos uploaded to the timeline. However, with modern web technologies, you can see the updates in realtime without having to refresh the page manually. This will create a database and public directory, and also an uploads directory inside the public directory. We will store our database file inside the database directory, we will keep our public files: HTML and images, inside the public and uploads directory. Create a new index.html file in the public directory that was created. Now let’s create our first (and only) Go file for this article. We will try to keep everything simple by placing all our source code in a single file. Create a main.go file in the project root. Above we have imported some packages we will be needing to work on our photo feed. We need the database/sql to run SQL queries, the io and os package for our file uploading process, and the net/http for our HTTP status codes. We have some other external packages we imported. The labstack/echo package is the Echo framework that we will be using. We also have the mattn/go-sqlite3 package which is for SQLite. Finally, we imported the pusher/pusher-http-go package which we will use to trigger events to Pusher Channels. Now that we have pulled in our packages, let’s create the main function. This is the function that will be the entry point of our application. In this function, we will set up our applications database, middleware, and routes. In the code above, we instantiated our database using the file path to the database file. This will create the SQLite file if it did not already exist. We then run the migrateDatabase function which migrates the database. We then set up some routes to handle our requests. The first handler is the File handler. We use this to serve the index.html file. This will be the entry point to the application from the frontend. We also have the /photos route which accepts a POST and GET request. We need these routes to act like API endpoints that are used for uploading and displaying the photos. The final handler is Static. We use this to return static files that are stored in the /uploads directory. 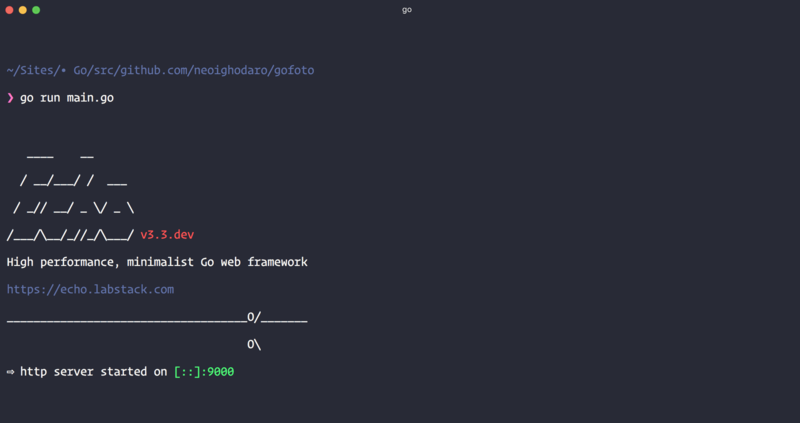 We finally use e.Start to start our Go web server running on port 9000. The port is not set in stone and you can choose any available and unused port you feel like. At this point, we have not created most of the functions we referenced in the main function so let’s do so now. Let’s create the data structure for our photo and photo collection. The next thing we will do is create the data structure for our object types. We will create a Photo structure and a PhotoCollection structure. The Photo struct will define how a typical photo will be represented while the PhotoCollection will define how a collection of photos will be represented. In the getPhotos method, we are simply running the query to fetch all the photos from the database and returning them as a JSON response to the client. In the uploadPhoto method we first get the file to be uploaded then upload them to the server and then we run the query to insert a new record in the photos table with the newly uploaded photo. We also return a JSON response from that function. The next thing we want to do is trigger an event when a new photo is uploaded to the server. For this, we will be using the Pusher Go HTTP library. This will create a new Pusher client instance. We can then use this instance to trigger notifications to different channels we want. Remember to replace the PUSHER_APP_* keys with the keys provided when you created your Pusher application earlier. This is the code that triggers a new event when a new photo is uploaded to our application. The next thing we want to do is build out our frontend. We will be using the Vue.js framework and the Axios library to send requests. In the HTML file above we have defined the design for our photostream. We are using Bootstrap 4 and we included the CSS in the HTML above. We are also using the Axios library, Pusher library, and Vue framework. We included the links to the scripts at the bottom of the HTML document. Above we created a Vue instance and stored the properties photos and loading. The photos property stores the photo list and the loading just holds a boolean that indicates if the photos are loading or not. In the mounted method we create an instance of our Pusher library. We then listen on the photo-stream channel for the new-photo event. When the event is triggered we append the new photo from the event to the photos list. We also send a GET request to /photos to fetch all the photos from the API. Replace the PUSHER_APP_* keys with the one from your Pusher dashboard. In the methods property, we added a few methods. The filePicker is triggered when the ‘Upload’ button is pressed on the UI. It triggers a file picker that allows the user to upload photos. The upload method takes the uploaded file and sends a POST request with the file to the API for processing. In this article, we have been able to demonstrate how you can use Pusher Channels in your Go application to provide realtime features for your application. As seen from the code samples above, it is very easy to get started with Pusher Channels. Check the documentation to see other ways you can use Pusher Channels to provide realtime features to your users.